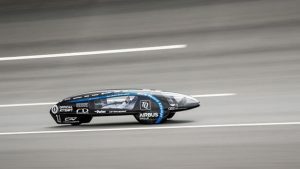 Technical University of Munich’s TUfast Eco Team has created a new Guinness World Record for the most efficient electric vehicle ever. The car chosen to topple the Guinness World Record was a modified TUfast eLi14, initially created for the 2014 Shell Eco Marathon. The custom-built eLi14 featured a motor controller with optimized acceleration and speed simulation, new rims with extremely low friction bearing, a motor with optimized magnet placement and silver wire coils for reduced ohmic (a non-rectifying electrical junction) losses. It was also bestowed with an aerodynamically optimized top cover without solar cells. Under the watchful gaze of Guinness World Record judges, the team initially managed an average energy use of 1142 km/kWh (710 mi/kWh). Having banked one run, the team tweaked the speed controller and tire pressure in search of more. What they got was 1232 km/kWh (765.53 mi/kWh). That’s the equivalent of about 0.009l/100km (26,135 US mpg), which would theoretically allow the car to cover 10,956 km (6808 mi) on just one liter of 95 RON petrol. The record attempt was achieved on Audi’s test track. TUfast chose the eLi14 over the eLi15 and eLi16 because it offered more aerodynamic advantages than the current models (which are built to newer version of the Shell Eco Marathon competition rules). Though old by two years, the eLi14 is very light and has a flexible running gear train.